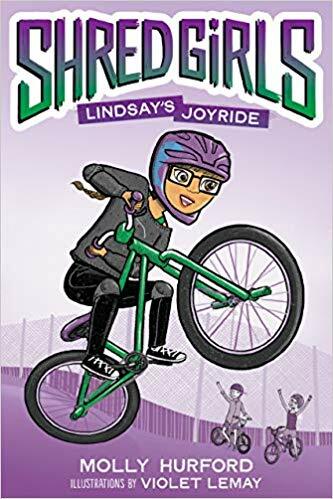 A few exciting Shred Girls notes… I know you’ve probably seen these if you follow Shred Girls on IG or follow me on there, but just in case… The pre-order for Shred Girls: Lindsay’s Joyride is open! The book is just the beginning of the Shred Girls series, and it’s my first foray into writing fiction—the series is for middle-grade readers, and whether your Shred Girl is already into bikes or if she’s more like me when I was younger and more into books than bikes, I hope she loves it. This series is so important to me: Young girls drop out of sports and particularly cycling right around this age because they don’t see themselves in the sport, and I want so badly to change that. If you preorder the book and email me a copy of your receipt and we’ll send you a signed Shred Girls postcard plus some sweet Shred Girls stickers that can be used on a bike frame, helmet or wherever. Lindsay’s Joyride ships on May 7, 2019—and we’ll have a bunch of launch events around it! An empowering new series from the cyclist who runs Shred-Girls.com is guaranteed to give readers an adrenaline rush–and the confidence girls gain from participating in sports! It’s time to ride and save the day! Lindsay can’t wait to spend her summer break reading comics and watching superhero movies–until she finds out she’ll be moving in with her weird older cousin Phoebe instead. And Phoebe has big plans for Lindsay: a BMX class at her bike park with cool-girl Jen and perfectionist Ali. Lindsay’s summer of learning awesome BMX tricks with new friends and a new bike turns out to be more epic than any comic book–and it’s all leading up to a jumping competition. But some of the biker boys don’t think girls should be allowed to compete in BMX. Now it’s up to Lindsay, Jen, and Ali to win the competition and prove that anyone can be great at BMX. Pre-order is also now open in Canada on Amazon + Indigo!! If you’re in Ontario, May 11 is the big launch party at Joyride150 bike park in Markham, ON, near Toronto. It’s $5 admission for women and girls (men are welcome at the park as well though!) and from 11-3, we’ll have snacks, mini-clinics, Shred Girls IRL and coaches helping you learn new skills, and tons of raffles and giveaways. I am SO excited. You can RSVP and get more info right here. And one last bonus: I wanted to put together a fun way to share some of my favorite quotes, inspirations, photos and sneak peeks at illustrations in the book, and for me, there’s no better way to share that stuff than in the pages of a zine. Some of you may remember zines, those homemade magazines that let girls share their feelings, their interests and their passions. There were tons of skater and BMX zines back in the day, and while mine was more poetry and punk rock 15 years ago—it was called So We Beat On—I brought back that style to present Shred Girls in a way that personally inspires me. If you come to the Joyride150 launch party on May 11 or attend any events with me this summer, I’ll have print copies available, but for now, if you sign up for the Shred Girls Newsletter, you’ll get the PDF download of V1 of the Shred Girls zine. Thanks so much to all of you who pre-order—it means the world to me, and it’s a huge help in getting the Shred Girls message spread around!